Region in the northeastern part of Switzerland. Of the Jewish communities designated as belonging to the district of the Lake of Constance, those of Ueberlingen, Constance, Schaffhausen, and Diessenhofen deserve special mention, although many others belong to the same district, as Bregenz, Engen, Aach, Feldkirch, Randegg, Isny, Donaueschingen, and Thiengen. This designation is found also in the "Memorbücher." The cemetery of the Jews at Ueberlingen is mentioned as early as 1226. The earliest Jewish settlement at Constance dates from the beginning of the thirteenth century. Jews of Schaffhausen are referred to in documents in 1299; while those of Diessenhofen are not mentioned until the fourteenth century, although probably some were living there long before that time. Procession of Jews Meeting Pope Martin v. at the Council of Constance, 1417. In 1314 the Jews of Ueberlingen paid their taxes to King Frederick and Duke Leopold of Austria; in 1332 they were cruelly persecuted, more than 300 being killed, and their synagogue destroyed. 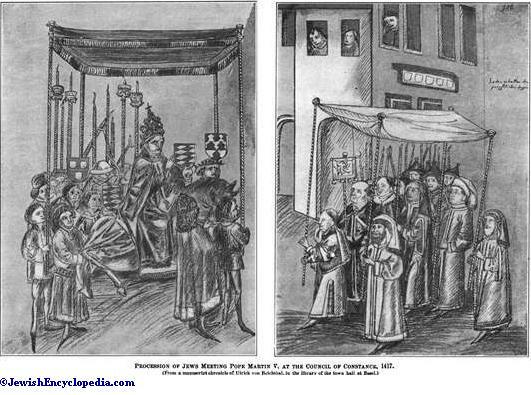 Their synagogue and the Jewish quarter are again mentioned in 1349, when the Jews were completely exterminated by the Flagellants (Feb. 11), while the tombstones of their cemetery were used in building the cathedral and the hospital. 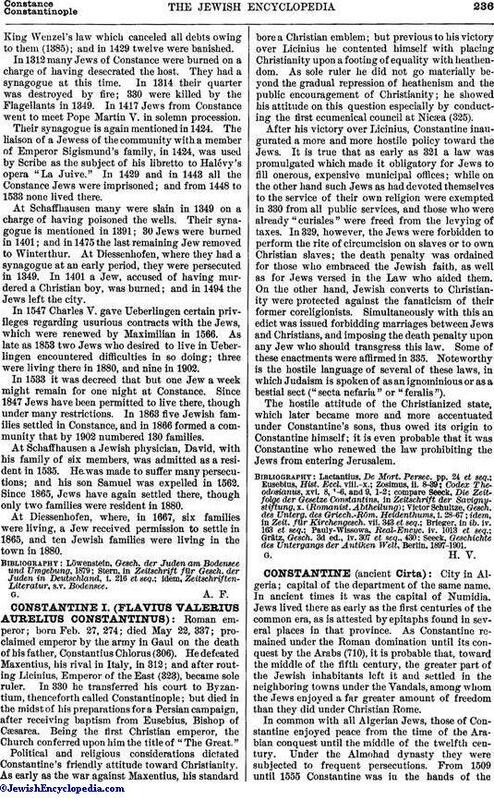 Jews were again admitted in 1378. They suffered much under King Wenzel's law which canceled all debts owing to them (1385); and in 1429 twelve were banished. In 1312 many Jews of Constance were burned on a charge of having desecrated the host. They had a synagogue at this time. In 1314 their quarter was destroyed by fire; 330 were killed by the Flagellants in 1349. 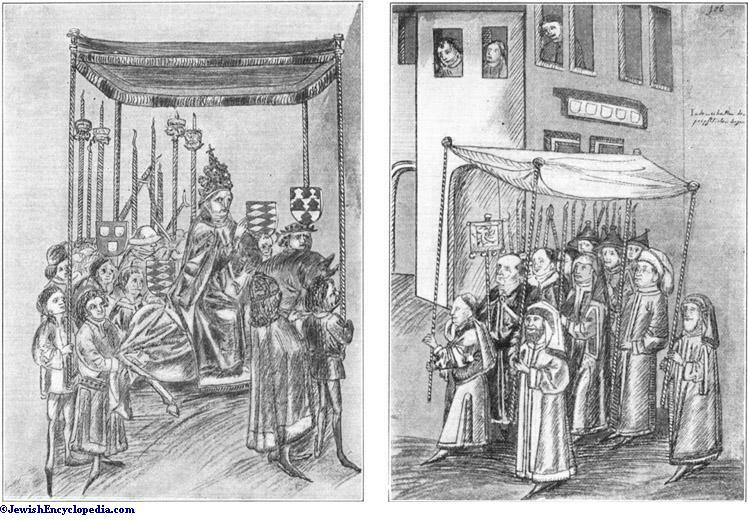 In 1417 Jews from Constance went to meet Pope Martin V. in solemn procession. Their synagogue is again mentioned in 1424. 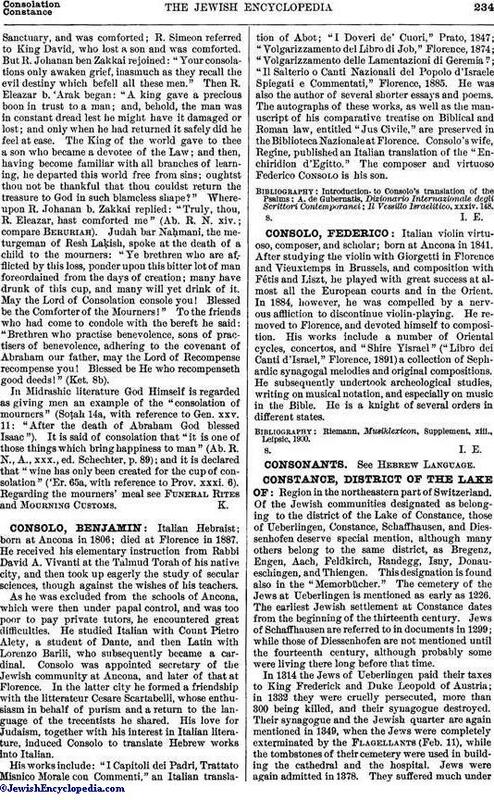 The liaison of a Jewess of the community with a member of Emperor Sigismund's family, in 1424, was used by Scribe as the subject of his libretto to Halévy's opera "La Juive." In 1429 and in 1443 all the Constance Jews were imprisoned; and from 1448 to 1533 none lived there. At Schaffhausen many were slain in 1349 on a charge of having poisoned the wells. Their synagogue is mentioned in 1391; 30 Jews were burned in 1401; and in 1475 the last remaining Jew removed to Winterthur. At Diessenhofen, where they had a synagogue at an early period, they were persecuted in 1349. In 1401 a Jew, accused of having murdered a Christian boy, was burned; and in 1494 the Jews left the city. In 1547 Charles V. gave Ueberlingen certain privileges regarding usurious contracts with the Jews, which were renewed by Maximilian in 1566. As late as 1853 two Jews who desired to live in Ueberlingen encountered difficulties in so doing; three were living there in 1880, and nine in 1902. In 1533 it was decreed that but one Jew a week might remain for one night at Constance. Since 1847 Jews have been permitted to live there, though under many restrictions. In 1863 five Jewish families settled in Constance, and in 1866 formed a community that by 1902 numbered 130 families. At Schaffhausen a Jewish physician, David, with his family of six members, was admitted as a resident in 1535. He was made to suffer many persecutions; and his son Samuel was expelled in 1562. Since 1865, Jews have again settled there, though only two families were resident in 1880. At Diessenhofen, where, in 1667, six families were living, a Jew received permission to settle in 1865, and ten Jewish families were living in the town in 1880.